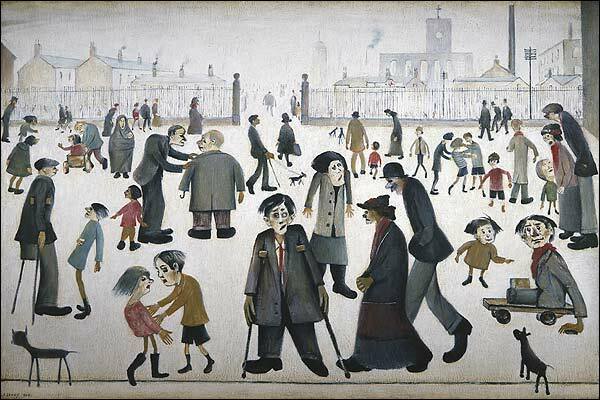 Lowry was born the only child of Robert Stephen, an Irish-born estate agent, and Elizabeth (née Hobson) a concert pianist and piano teacher in the middle class suburb of Victoria Park in Rusholme. His family called him 'Laurie'. It was a difficult birth and his mother, who had been hoping for a girl, was uncomfortable even looking at him at first. Later she expressed her envy of her sister Mary, who had "three splendid daughters" instead of one "clumsy boy". 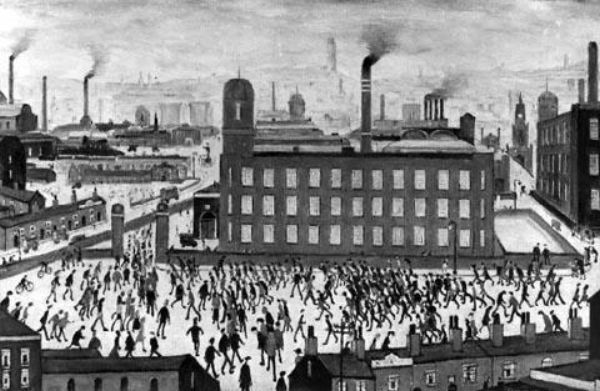 After Lowry's birth his mother's health was too poor for her to continue teaching. She is reported to have been gifted and respected. She was an irritable, nervous woman who had been brought up to expect high standards by her stern father. Like him she was controlling and intolerant of failure. She used illness as a means of securing the attention and obedience of her mild and affectionate husband and she dominated her son in the same way. 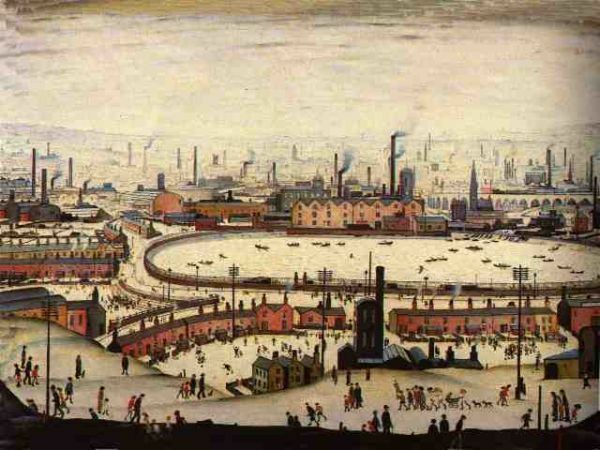 Lowry had an unhappy childhood. At school he made few friends and showed no academic aptitude. His father was affectionate towards him but he could not gain the approval that he craved from his mother. When he reached school-leaving age his vocation was not obvious but an aunt noted that he had been good at drawing ships, so in 1903 his parents enrolled him in private art lessons with Reginald Barber despite his father's completely indifference towards the illustrative arts. A year later, at seventeen, he started work as a clerk with a Manchester chartered accountant. From 1905 he attended evening classes at Manchester College of Art studying classes in freehand drawing, light & shade, preparatory antique and, when his aptitude became apparent, life studies under Pierre Adolphe Valette. He was employed as a clerk for the General Accident Fire and Life Assurance Company in 1907 and he started private art classes with the American portrait painter William Fitz in the same year. In 1909 his father's business failed and the family had to move to a smaller house at 117 Station Road, Pendlebury, an industrial suburb to the northwest of Salford. 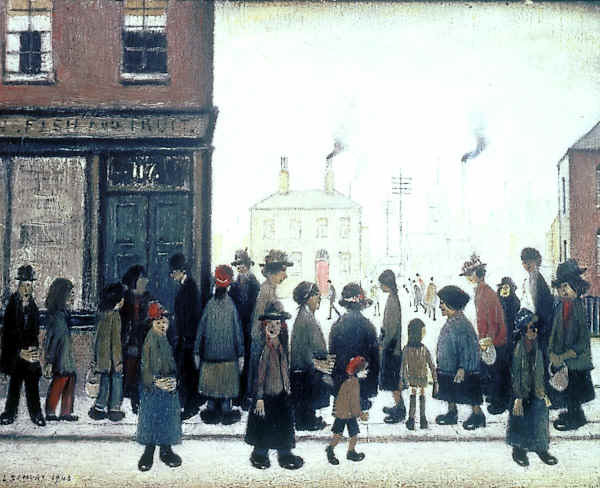 Lowry became a rent collector for the Pall Mall Property Company in 1910. It is at this time that he took up painting seriously and his sketchbooks were filled with images from the streets and homes that he visited for his day job. In 1915 he started evening classes at Salford School of Art under Bernard D Taylor and the stylised human form that became his trademark began to emerge. 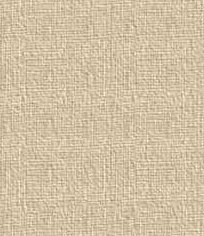 Taylor encouraged him to use the white backgrounds that would come to be one of his trademarks. In 1928 he stopped attending art school. He first exhibited in 1919 with two paintings at the Annual Exhibition the Manchester Academy of Fine Arts and showed widely throughout the 1920s although his work was often dismissed as amateurish and childlike. 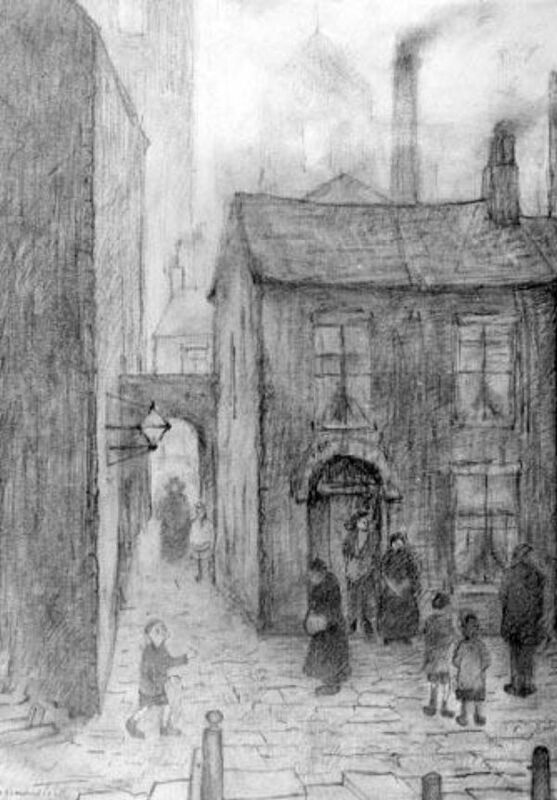 In 1921 he exhibited his work in the offices of the Manchester architect Roland Thomasson and sold his first picture, a pastel entitled The Lodging House. He entered paintings in the Paris Salon, with the New English Art Club (from 1927 to 1936), in Dublin, Manchester and Japan. Lowry illustrated A Cotswold Book written by H. W. Timperley in 1930 with twelve drawings made soon after he held a solo exhibition of drawings at the Round House gallery at Manchester University. The book was published in 1931. In 1938, Alexander J. McNeill Reid, a director of the Lefevre Gallery in London, saw several of Lowry's paintings awaiting framing at James Bourlet & Sons Limited (now the transport division of Sotheby's auction house). He inquired after the artist and in 1939 a one-man exhibition of his paintings was held at the Lefevre Gallery (some books on Lowry call it the Reid & Lefevre Gallery). That exhibition sold sixteen paintings including one to the Tate Gallery (for just £15). 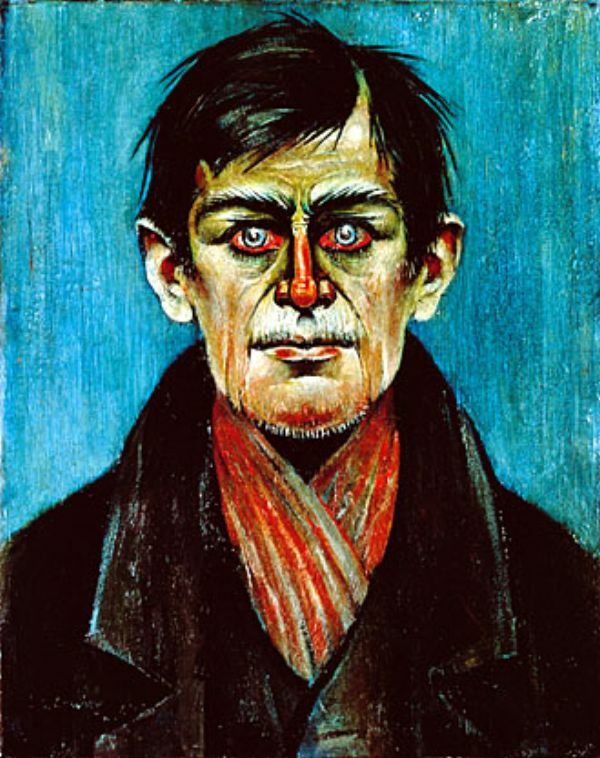 It came as a very pleasant surprise to Lowry, who said that the show gave him more pleasure than anything else in art. The (Reid &) Lefevre Gallery showed 15 solo exhibitions of his work between 1945 and 1979. He first exhibited at the Manchester Academy of Fine Arts (MAFA) in 1932, was elected a member in 1934 and continued to exhibit there annually until 1972. 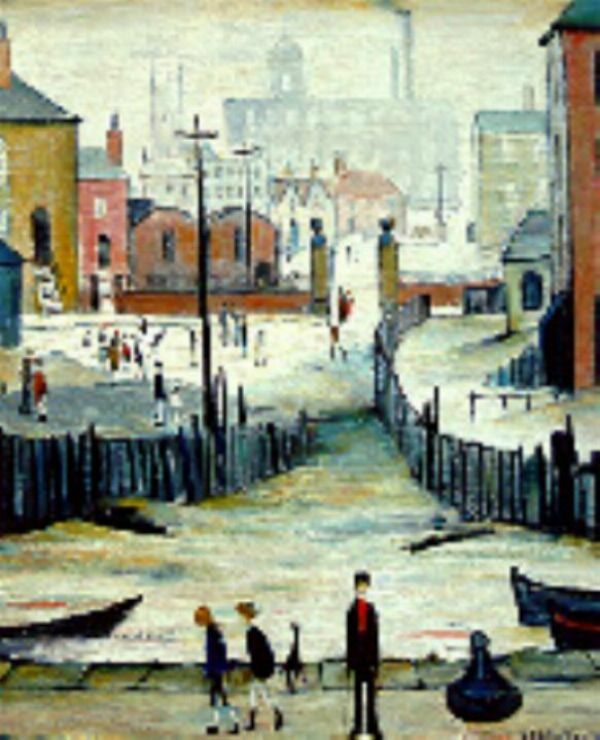 In 1936 Salford City Art Gallery bought its first Lowry painting from the MAFA exhibition; it was A Street Scene painted in 1928. The city held its first one man show of his work in 1941 and opened a permanent collection of his work in 1958. He became a member of the Royal Society of British Artists in 1934. He first exhibited at the Royal Academy Summer Show in 1932 and was elected an Associate in 1955 and a full Royal Academician in 1962. 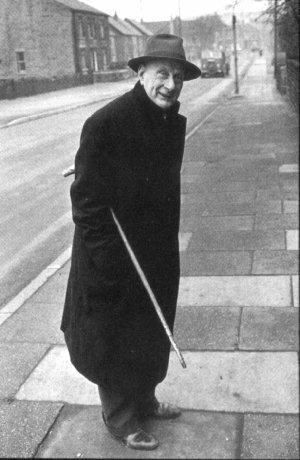 Lowry and some other members of the Manchester Arts Club formed a sub-group called the Manchester Group, which exhibited at the Midday Studios, Moseley Street, Manchester and elsewhere in the city until 1956. Retrospective exhibitions of his work include those at Salford City Art Gallery as part of the 1951 Festival of Britain, the Manchester City Art Gallery in 1959, the Graves Art Gallery, Sheffield in 1962, and at the Stone Gallery, Newcastle-upon-Tyne in 1964. In 1965 the Arts Council curated a touring retrospective exhibition that ended with a six-week show at the Tate Gallery in 1967. The Royal Academy, London held a posthumous tribute in 1976. His father died in 1932 leaving debts and his mother, who had been subject to neurosis and depression, became bed ridden. Lowry's mother had always been a very important figure in his life and now he had to care for her. He painted from 10 pm to 2 am after his mother had fallen asleep. He frequently expressed regret that he received little recognition as an artist until the year that his mother died and that she had never been able to enjoy his success. 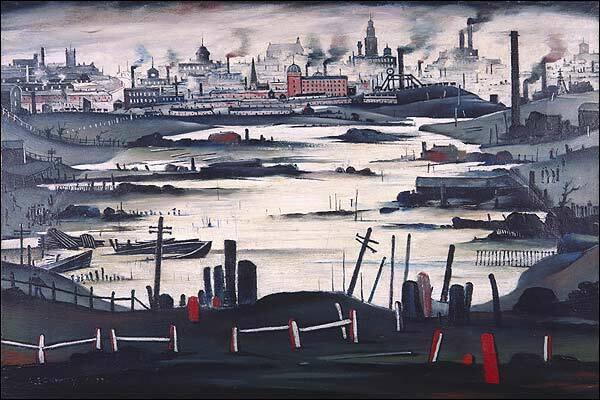 From the mid 1930s until at least 1939 Lowry took annual holidays at Berwick-upon-Tweed. 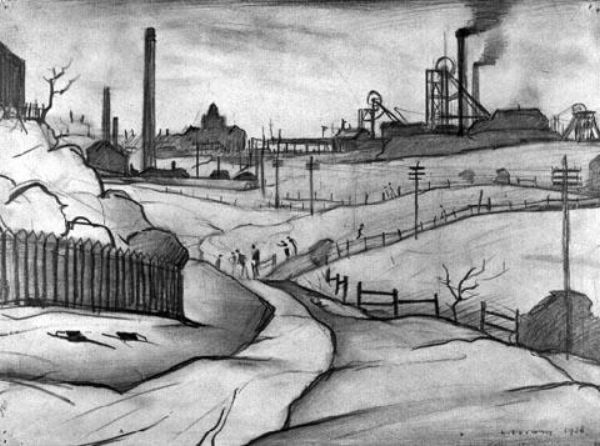 With the outbreak of war Lowry served as a volunteer fire watcher in Manchester and accepted an invitation to become a war artist. In 1953 he was appointed Official Artist at the coronation of Elizabeth II of the United Kingdom. With the death of his mother in October 1939 Lowry became depressed and neglected the upkeep of his house to such a degree that the landlord repossessed it in 1948. He was not short of money and bought The Elms in Mottram-in-Longdendale, Cheshire. Although he considered the house ugly and uncomfortable he stayed there until his death almost thirty years later. In his new home he employed a housekeeper, Mrs Bessie Swindells, who ensured that he and his home were adequately maintained. She would cook his breakfast and leave a supper for him. Lowry retired from the Pall Mall Property Company in 1952. During his career he had risen to become chief cashier but he never stopped collecting rents. The firm had supported his development as an artist and he was allowed him time off for exhibitions in addition to his normal holiday allowance. It seems, however, that he was not proud of his job; his secrecy about his employment by the Pall Mall Property Company is widely seen as a desire to present himself as a serious artist but the secrecy extended beyond the art world into his social circle. Margery Thompson first met him when she was a schoolgirl and he became part of her family circle. He attended concerts with her family and friends, visited her home and entertained her at his Pendlebury home where he shared his knowledge of painting. They remained friends until his death but he never told her that he had any work except his art. In the 1950s he regularly visited friends at Cleator Moor, Cumbria (where Geoffrey Bennett was Manager at National Westminster Bank and Southampton (where Margery Thompson had moved upon her marriage). 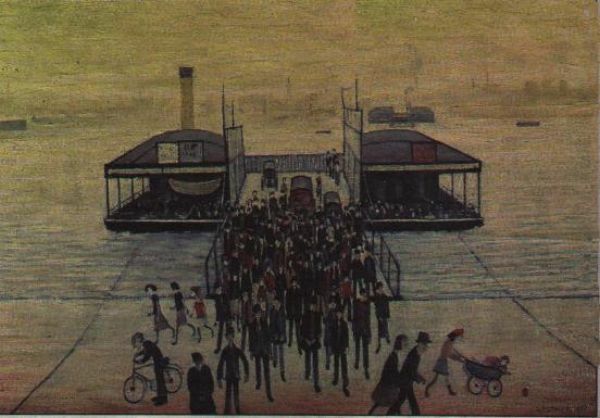 Lowry painted pictures of the bank in Cleator Moor, Southampton Floating Bridge and other scenes local to his friends' homes. He befriended the 23-year-old Cumbrian artist Sheila Fell in November 1955 and supported her career by buying several pictures that he gave to museums. In 1957 an unrelated thirteen-year-old schoolgirl called Carol Ann Lowry wrote to Lowry at her mother's urging to ask his advice on becoming an artist. He visited her home in Heywood, Greater Manchester some months later and became a family friend. He was awarded an honorary Master of Arts from the University of Manchester in 1945, and Doctor of Letters in 1961, and given freedom of the City of Salford in 1965. In 1975 he was awarded an honorary Doctor of Letters by the University of Salford and the same degree by the University of Liverpool. The art world celebrated his 77th birthday (in 1964) with an exhibition of his work and that of 25 contemporary artists who had submitted tributes to Monk's Hall Museum, Eccles. 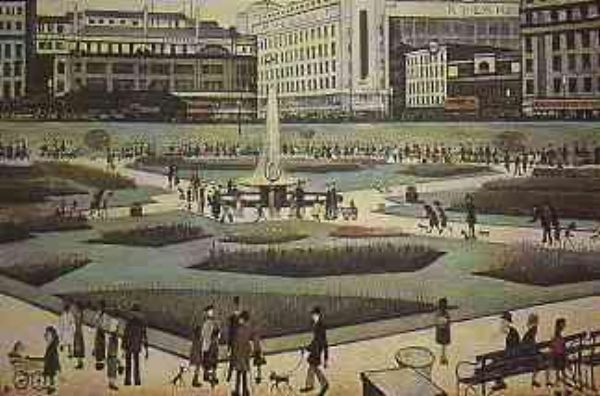 The Hallé Orchestra also performed a concert in his honour and Harold Wilson used Lowry's painting The Pond as his official Christmas card. Lowry's painting Coming out of school was the stamp of highest denomination in a series issued by the Post Office depicting great British artists in 1967. 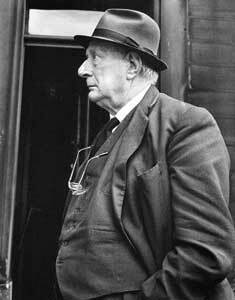 He died of pneumonia at The Woods hospital in Glossop on 23 February 1976 aged 88. He was buried in Chorlton Southern Cemetery, Manchester next to his parents. He left his estate to Carol Ann Lowry. Lowry never married although he had several young female friends. He claimed never to have "had a girl [friend]". He said that he lived for his mother and that all he wanted was her smile or a word of praise from her. 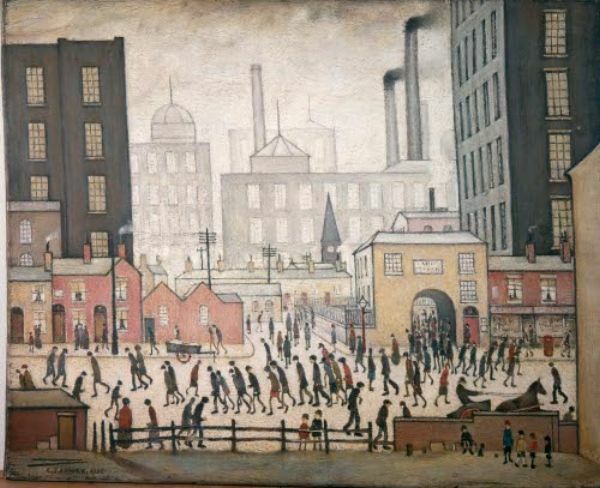 His father was indifferent to his artistic activity and although Lowry believed that his mother did not understand his painting, "she understood me and that was enough". Elizabeth Lowry never did appreciate her son, however. 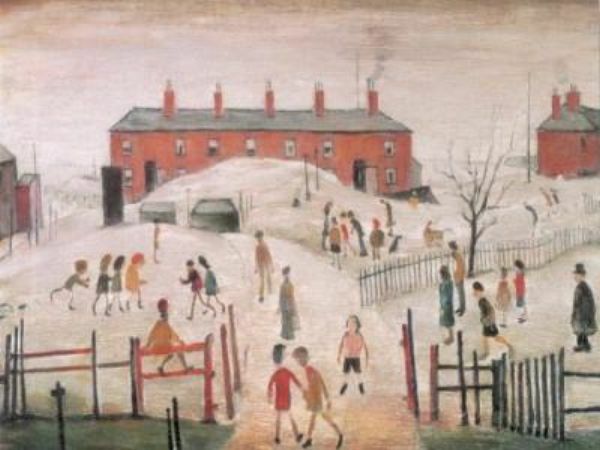 In later life, starting in the 1950s, Lowry would often spend holidays at the Seaburn Hotel in Seaburn, Sunderland, Tyne & Wear, painting scenes of the beach, as well as nearby ports and coal mines. It is believed that the sea air appealed to him, as well as the industrial scenes that were very different from the satanic mills of Greater Manchester. Lowry is fondly remembered in the city as a kindly old man, always wrapped up even at the height of summer, who kept himself to himself. When he had no sketchbook with him, Lowry would often draw scenes in pencil or charcoal on the back of scrap paper such as envelopes, serviettes, and cloakroom tickets and present them to young people sitting with their families nearby. 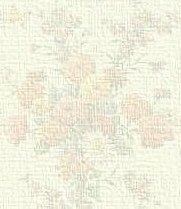 Such serendipitous pieces are now worth thousands of pounds; a serviette sketch can be seen at the Sunderland Mariott Hotel (formerly the Seaburn Hotel). He may have had Asperger's Syndrome (the high-functioning form of autism) but this remains a contentious diagnosis that is not shared by those that knew him personally. He was a secretive and mischievous man who enjoyed stories irrespective of their truth. His friends have observed that his anecdotes were more notable for their humour than their accuracy and in many cases he set out deliberately to deceive. His stories of the fictional Ann were inconsistent and he invented other people as frameworks upon which to hand his tales. The collection of clocks in his living room were all set at different times: to some people he said that this was because he didn't want to know the real time; to others he claimed that it was to save him from being deafened by their simultaneous chimes. The contradictions in his life are exacerbated by this confusion. He is widely seen as a shy man but he had many long-lasting friendships and made new friends throughout his adult life. He was contrary and could be selfish but he was generous and concerned for the well-being of his friends and of strangers. It may be as Sheila Fell has said: "He was a great humanist. To be a humanist one has first to love human beings, and to be a great humanist one has to be slightly detached from them." In later life he grew tired of being approached by strangers on account of his celebrity and he particularly disliked being visited at home in this way. 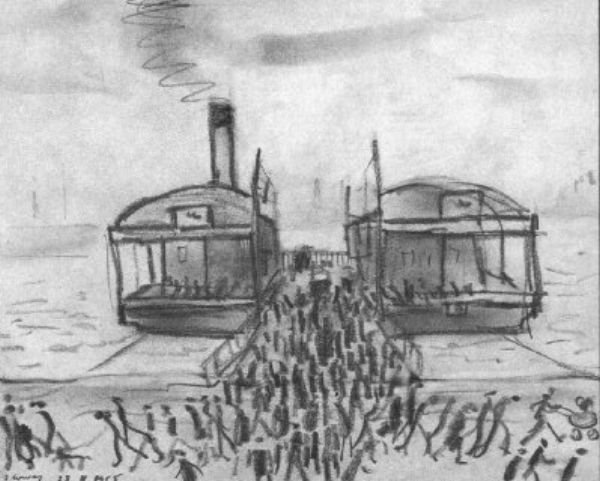 Another of his unverifiable stories had him keeping a suitcase by the front door so that he could claim to be just leaving, a practice he claimed to have abandoned after a helpful young man insisted on taking him to the station and had to be sent off to buy a paper so that Lowry could buy a ticket for just one stop without revealing his deceit.